Places Where Kids Eat Free In Brisbane | Monday - Sunday! Places Where Kids Eat Free In Brisbane | Monday – Sunday! An up to date list of all the best places where kids eat free in Brisbane! As the cost of eating out continues to rise, the family-restaurant experience is becoming a luxury that many people simply cannot afford on a regular basis. Sure, a children’s meal typically only cost from $9 to $15, but the bill will quickly skyrocket when there are more mouths feed. 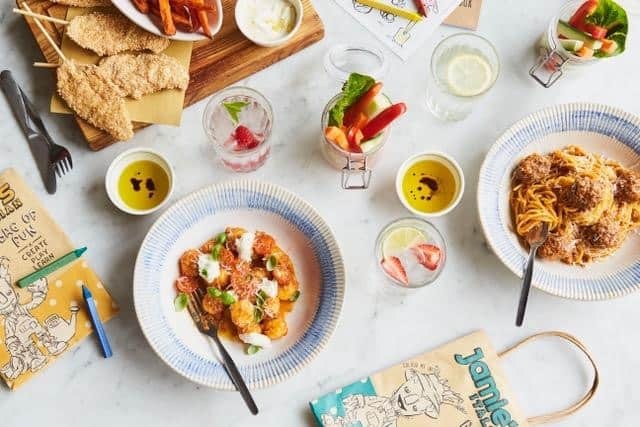 However, restaurants and cafes throughout Brisbane are offering a solution through their ever-so-generous ‘Kids Eat Free’ promotions – you just have to know where and when to look. Not sure where to begin your search for a restaurant, pub or cafe? Don’t worry about it, we’ve done all the heavy lifting for you. 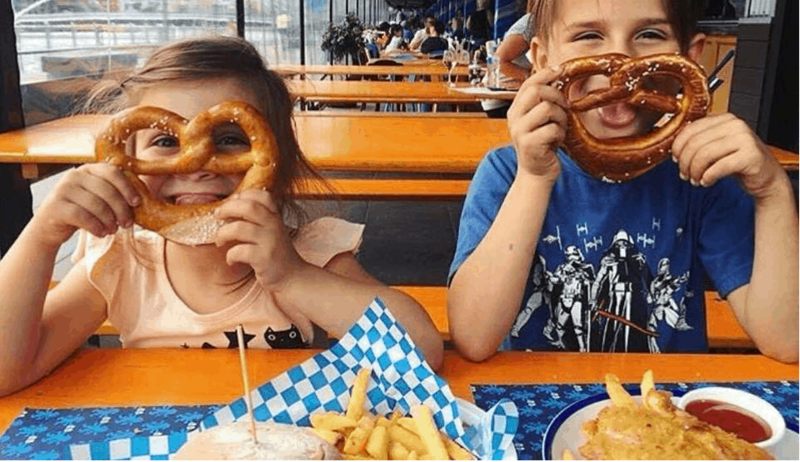 Whether you’re heading out for a mid-week bite or a weekend feast, check out our guide below to help find a spot to feed the kids without the need to reach for your wallet. If you’re looking for value on a Monday night, The Gap Tavern has you covered. Kids can choose between favourites such as chicken nuggets, spaghetti bolognese, battered fish, burgers, pizzas, and much more. All meals come with a side dish (chips or mash potato), along with a drink. On any other day, the venue proves to offer good value with meals on the children’s menu costing only $9 each. On Mondays, children can eat for free from the venue’s bar menu. Kids have the option of a rib fillet, battered flathead, or chicken nuggets. Not to mention, all meals come with a soft drink. The Forest Lake Tavern offer their ‘Kids Eat Free’ promotion every Monday with any main meal purchase. To qualify for the deal, children must be a ‘Kid’s Club’ member. Children can choose between popular favourites such as grilled cheeseburgers, fish and chips, chicken nuggets and pizza. All kid’s meals come with a side dish (chips, salad or vegetables), along with a drink. Kids eat for free at the Saltwater Creek hotel from 5:30 pm alongside a paying adult. Children have the option to choose between fish cocktails, chicken nuggets, or rib fillets. With every adult meal purchased at the Ferny Grove Tavern, kids eat dinner for free with the option of steak, chicken nuggets, a cheeseburger or fish and chips. 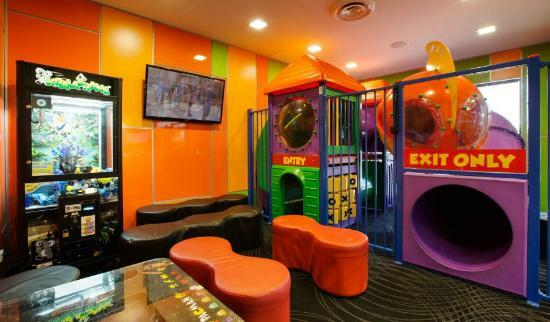 They also have a kids club and indoor kids play area to take advantage of!! Similarly, with many ‘Kids Eat Free’ offers, this offer cannot be coupled with other discounts/ promotions. Available on both Mondays and Tuesdays, kids can eat for free at CSI. With every adult main meal purchased, kids can choose between chicken nuggets, cheeseburgers, ham, and pineapple pizza, fish bites, and spaghetti. To top it off, activity bags are all available to entertain the children. Conditions apply – this promotion cannot be used alongside any other offers. Also available on Mondays and Tuesdays, the Hogs Breath Cafe offers free kid’s meals alongside any main meal purchase. All kid’s meals include a drink and ice-cream. Children have the option of fish, cheeseburgers, steak, pasta, chicken, and much more. This promotion is at participating Hog’s Breath Cafes only. The adult main meal must be at least $20. Address: You can find your local Hog’s Breath Cafe here. To receive a free kid’s meal and a raspberry slushy at Pepe’s Mexican restaurant, you must purchase any dine-in meal valued over $15. Kids can choose between the nachos, a burrito or nuggets, and fries. Any other day, all kid’s meals are only $7 each. With any paying adult, kids eat lunch and dinner for free every Wednesday at the Albany Creek Tavern. With a wide range available, including chicken parmigiana, battered flathead, and chicken sliders, there’s a little something for everyone. Can’t make it on Wednesday? Alternatively, kid’s meals are only $5 each on Sunday nights. 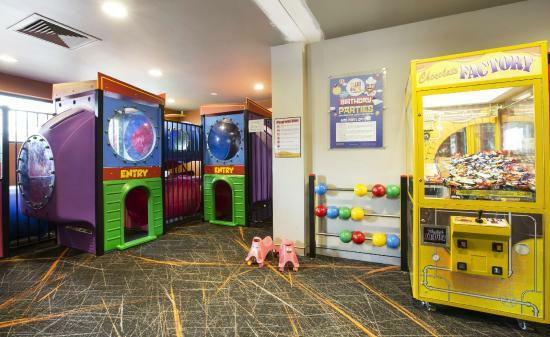 The Glen Hotel is not only equipped with an adventure playground for the kids to explore, but they also eat for free on Wednesday nights. With the purchase of any main meal, receive one kid’s meal free of charge. With a very diverse menu, including BBQ Ribs, grilled steak, fish and chips, cheeseburgers, salami pizza, and much more, there’s an option to satisfy anyone’s taste buds. Every Wednesday night at Ipswich’s Yamanto Tavern, kids eat for free with every main meal purchase. Children have the option of macaroni carbonara, chicken nuggets, bacon and pineapple pizza, cheeseburgers, fish bites, or vegetable quiche. All meals come with chips or salad, and a drink. The Barcella restaurant offers free kid’s meals from Monday to Wednesday after 4 pm. The promotion is available when you purchase a main meal over $20. Children can choose among all the popular favourites, such as pizza, chicken nuggets, fish, and spaghetti. Offering all the classics, including cheeseburgers, chicken nuggets, and battered fish; kids eat for free on Thursdays and Sundays at the Capalaba Tavern. Each meal comes with a side dish (small chips or garden salad) and a drink. Every other night of the week, kid’s meals are only $9 each. Only available these school holidays, kids eat for free between 11 am and 4 pm at the various Bavarian Cafe locations. Children can choose from German dishes such as hot dogs, grilled chicken wraps, chicken schnitzels, and much more. To top it off, activity packs are provided to keep the kids entertained. Conditions apply – the promotion is offered alongside the payment of a full price adult main meal. The promotion expires 29 January 2019. Address: various venues – check with the restaurant before attending. Why not enjoy your lunch with a view? Kookaburra Showboat Cruises is offering a promotion where you can do just that! Children can hop aboard the cruise and eat for free on any regular lunch or high-tea cruise. To top it off, kids get to meet the captain. Conditions apply – one adult ticket covers 1.5 children. The offer cannot be combined with any other discount. 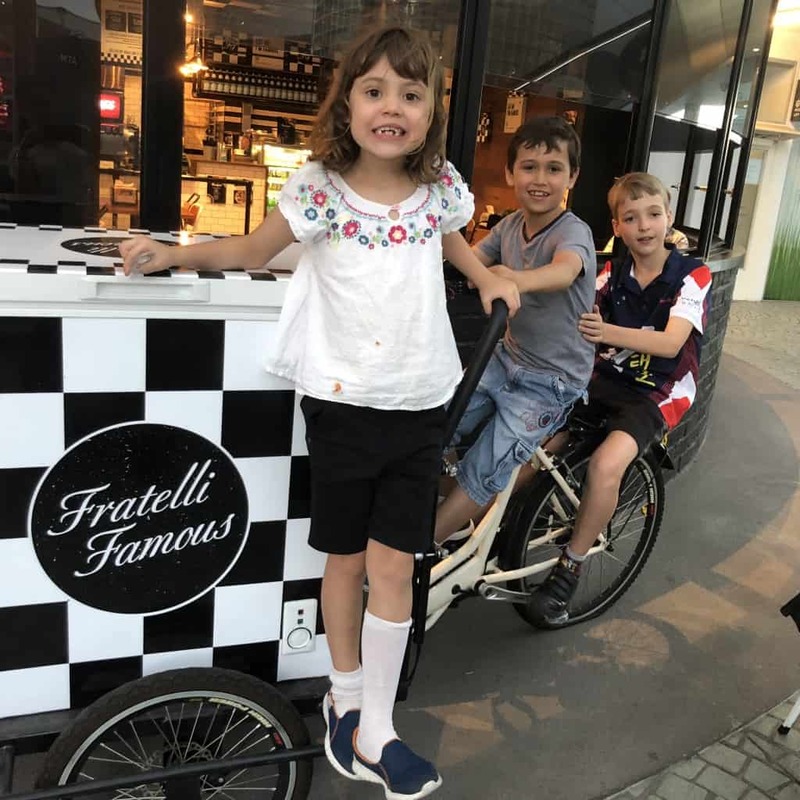 Although it can be difficult to find a restaurant that has a ‘Kids Eat Free’ promotion on a Friday, Fratelli Famous is the exception. Offering a wide selection of meals to choose from, the venue provides the promotion all day, every day. Kids can choose from a variety of Italian dishes, including various pizzas, pasta, and salads. The special only applies to main meals. Drinks and sides are not included. Want to combine a free kids meal with a weekend getaway? Enjoy a deal where the children can stay and eat for free! This school holidays, Novotel Brisbane is offering an array of deals, including full buffet breakfast, overnight accommodation, and more! Conditions apply. If you’re looking for a ‘Kids Eat Free’ buffet option, the Redbank Plains Tavern might be your best option. The venue offers an extensive buffet, free of charge, for children between the ages of 0-3 years. The menu includes roasts, soups, salads, pizza, pasta, and many other classics. For children over 3 years, the cost will vary between $8 and $12. Starting every Wednesday and running through to Sunday, kids eat for free at the Cleveland Tavern, making it one of the few venues offering this promotion on a Friday and Saturday. The offer is available for both lunch and dinner and is triggered through the purchase of a main meal at full price. Kid’s menu items include crumbed chicken, steak and chips, chicken schnitzel, and cheeseburgers. All options come with a soft drink, ice cream, and an activity pack. The Captain Cook Tavern offers their ‘Kids Eat Free’ promotion every Thursday and Saturday night, alongside a generous range of meal options. Children can choose from chicken nuggets, chicken schnitzel, fish and chips, cheeseburgers, spaghetti, calamari, or a rib fillet. All meals come with chips and salad or vegetables, along with a drink. Kicking off on Monday nights and running through to Saturday, kids eat for free at Wilston’s Tomato Brothers. With every main meal you purchase, you will receive one free kid’s meal, although terms and conditions apply. You must dine between 5 and 6 pm, any pizzas ordered as a main must be large, salads aren’t included as mains, and no other discounts can apply on top of this offer. Children can choose between a pizza or pasta dish, while also receiving a small drink and dessert to accompany the meal. The Beach Houses’ weekly ‘Kids Eat Free’ offer begins from 11 am every Sunday and includes items such as calamari, burgers, pasta, nuggets, and fish. On top of this, the venue also provides kids with complementary activity sheets for them to enjoy. Moorooka’s Red Lion Hotel offers their ‘Kids Eat Free’ promotion all day every Sunday. Kids have the choice of nuggets, calamari, pizza, or spaghetti. All meals also come with a kid-size juice. Every Sunday at the Pub Lane Tavern, kids can choose between classic dishes such as chicken nuggets, chicken schnitzel, fish and chips, steak, spaghetti, or cheeseburgers, at zero cost. All meals come with chips and salad or vegetables, as well as a drink. If you can’t make it on Wednesday, don’t worry. The tavern is offering $5 kid’s meals across the school holidays. Along with Friday’s face painting and weekly prizes, kids eat free all day Sunday at the Kallangur Tavern. From chicken nuggets, cheeseburgers and steak to calamari rings, fish, and dagwood dogs, there’s something for everyone. All meals come with chips or vegetables, along with a drink. In selected locations, Toscani’s is offering their ‘Kids Eat Free’ promotion from Sunday to Wednesday for a limited time. For each large main meal purchased, you’ll receive one free kid’s meal. Kids can choose from chicken strips, steak, fish and chips, or spaghetti. This offer is not available at Toscani’s South Bank venue. Although it’s not exactly for free, it’s the next best thing – every Sunday, kids eat for only $1 at the Centenary Tavern. Kids under 13 years can choose between chicken nuggets, chicken schnitzel, fish and chips, a grilled cheeseburger, spaghetti, steak, or ham and pineapple pizza. All meals come with chips and salad or potato and vegetables.